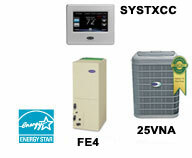 The revolutionary Infinity heating and air conditioning system from Carrier is the ultimate comfort system of the future. 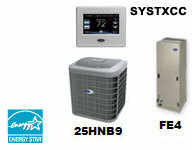 Highest cooling and Heating efficiency, 20 SEER* and 13.5 HSPF. WiFi Compatible. System cooling efficiency of 19 SEER*. WiFi Compatible. Contact Simpson Air by calling us at (813) 558-0858, or online to request a free estimate to replace your existing system.